Formed in 1997, the Australian Nuclear Free Alliance (formerly the Alliance Against Uranium) brings together Aboriginal people and relevant civil society groups concerned about existing or proposed nuclear developments in Australia, particularly on Aboriginal homelands. The Alliance provides a forum for sharing of knowledge, skills and experience. It is an opportunity to come together and find strength through our shared aims to protect country and culture from nuclear developments. The Alliance helped to build the successful campaign to stop the Jabiluka uranium mine in the Northern Territory, and more recently, proposed national nuclear waste dumps in South Australia and Muckaty in the NT. 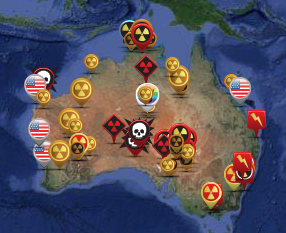 Currently, Aboriginal communities face a wave of uranium exploration, several proposed new uranium mines, and a proposed national nuclear waste dump.